With the colors of the Union Jack scattered all around town, it just seemed appropriate that my crisps should represent the flag too. Pretty cool, huh? 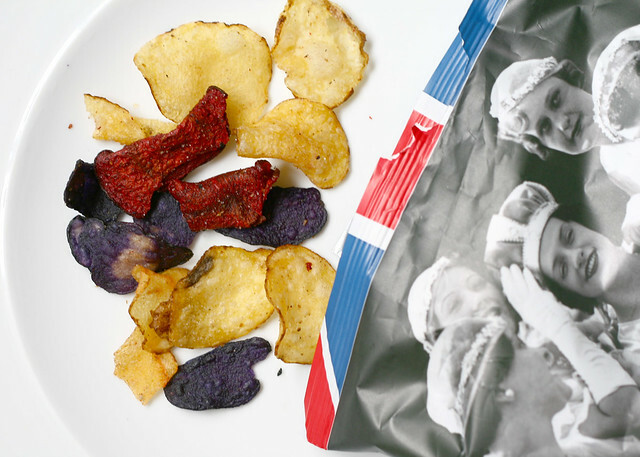 Just in case you think they're dipped in artificial colors, these Tyrell's crisps are in fact made from rather rare breed of spuds - Clara blue, Highland Burgundy Red (mixed with beetroot) as well as the popular White Lady Claire. I stumbled upon a yoghurt ice cream cart in La Spezia, Italy not too long ago. The frozen yoghurt was piped over a medley of summer fruits. It tasted like manna from heaven. I've been searching for a similar replacement since. I was thrilled to discover Yeo Valley Strawberry Yeoghurt Ice cream. Just as well they're heavily discounted at the moment (£1.74 per 900ml) given that I've been scarfing the lot by the bucket. The ice-cream's my cheap and relatively guilt free indulgence. I'm a plant killer. There, I've said it. I've got two black thumbs. I've decided to spare the lives of innocent plants by just buying potted herbs and lettuce instead. Pesticide free, fresh, yada yada yada. And I didn't even have to dig, buy compost and sacrifice virgin seedlings. Yep we've all gone red, white and blue too! I love Yeo Valley! Used to buy YV everything when the kids were younger. I got the double pots of basil lol! Was going to ask if you have any easy recipes to use them up and/or can we freeze the leaves? Forgot to scatter them on our pizzas the other day.. 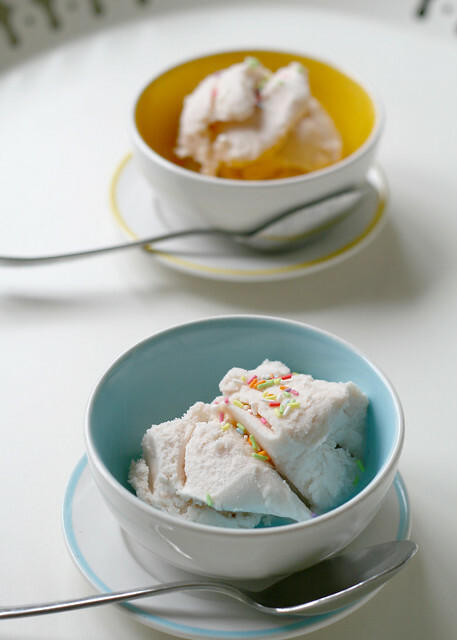 I discovered yoghurt ice cream while in Italy too and can't get enough of it either! So original and tasty. 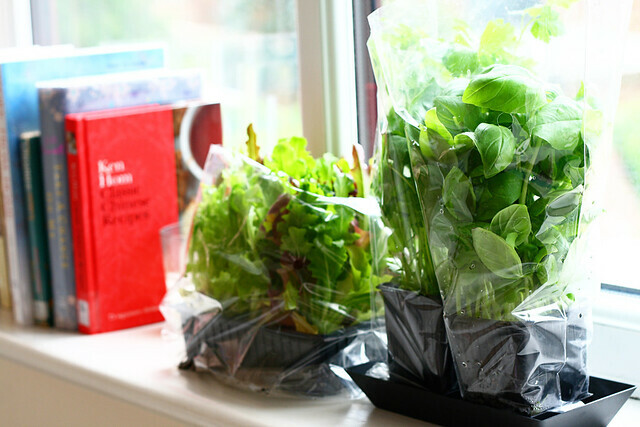 Great idea about buying potted herbs and lettuce! I've been thinking that starting an indoor herb garden would be the smartest thing for me to do since I always love fresh herbs--but I very rarely need a gigantic bundle from the grocery store! "I'm a plant killer". Did you say that in the same tone as the little boy in The Sixth Sense who says "I see dead people"?. Have to admit, I'm not great with plants. I can't think how many herb plants we've had since January when the hubs declared we needed herbs on the window sill to annoy me and block out the sunlight. I need to try that Yeo Valley stuff, its sounds yummy! Love the crisps, how novel! Amazing pictures my dear !! Join the black thumb club! The crisp is something, isn't it? That's my big time weakness.. chips! Great photos. 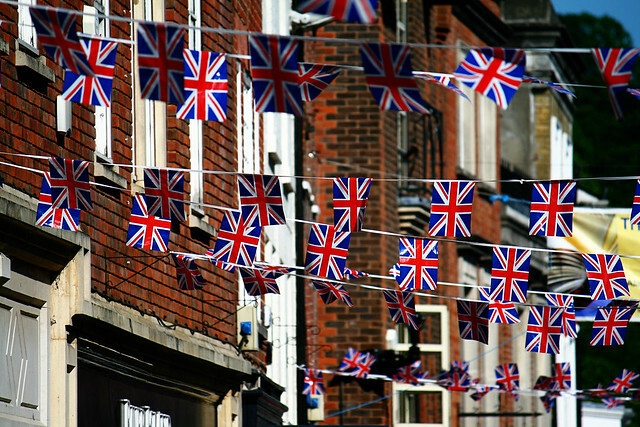 I can't imagine how fun and festive England is- how fun. Buying fresh herbs and lettuce is so good. take care and hope you had wonderful weekend!!! I've never seen those different coloured chips before! Beautiful! Your blog is so clean and elegant. London must be a fun place to be right now! I've got a jewellery giveaway that I'd love for you to enter! I have never been able to keep a plant alive -- until Mr. A came into my life. Suddenly, all of the flowers he gives me stay alive for weeks. Maybe he is magical. I once killed an aloe plant ... And they're supposed to be hardy! Your photos are lovely - so vibrant they jump off the page. Hope you had a lovely weekend! Well wait till you hear this... I am so bad with plants, I once killed a cactus!!!! I honestly thought they were impossible to kill. Apparently they're not. I over watered it. Yeah. Im thattttt bad haha. Love those crips though, very patriotic of you :P Hope your weekend has been filled with everything you hoped it would. Love these photos, especially the first one. The colors are so vivid! Ooh yes, I have a hydroponic basil plant and it has introduced such a nice natural beauty into my urban life. And they are easy to care for! just give them some sun and remember to water!